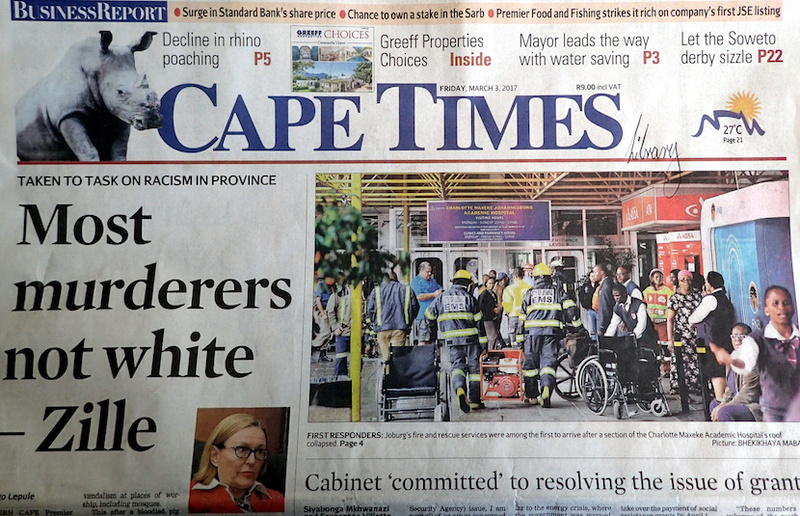 For the past year the Cape Times has run a series of front-page articles claiming that an international media organisation, Newseum, has rated the front page of the Iqbal Survé-owned newspaper as among the best in the world. On 10 February this year the Cape Times headline was Fifth Cape Times nod at the Newseum in US and editor Aneez Salie said: “It is really heartening that the honouring of our front pages by the Newseum, five now, has proven to be no flash in the pan.“In fact, many papers here and abroad are adopting our style, which is very humbling.“It also negates the efforts of those who sought to rubbish the change in ownership, leadership and ethos at the Cape Times and Independent Newspapers, who predicted we would fall. 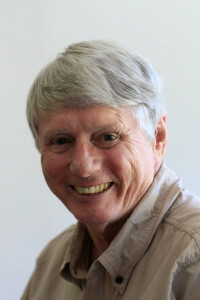 The above-mentioned article was sent to Newseum with a question: What was the criterion which has resulted in the Cape Times front page being repeatedly selected as one of the best in the world as the front page banner headline Cape Times rated among world’s top 10 again by Newseum stridently proclaimed? Thank you for your interest in the Newseum’s Today’s Front Pages exhibit. We display front pages from around the world every day. By putting a newspaper on display, we are not selecting it for its quality, we are simply showing how various news organizations around the world report the day’s events. So much for ‘Being recognised consistently as among the very best in the world’. So much for the vaunted ‘transformed ownership, leadership and ethos’. So much for the attack on ‘…those who defend colonialism and who ban newspapers who refuse to be lapdogs.’ – a clear reference to Helen Zille. So will the Cape Times publish an apology for misleading its readers with the Newseum front page leads, for once again, yet again, misleading its readers with its now systemic Fake News articles? Former staff members at Newspaper House, headquarters of the Cape Times and the Cape Argus in Cape Town’s CBD, tell me that there has been, since the Sekunjalo takeover, an absolute obsession with smearing Helen Zille. Fake News? Another Cape Times front page lead which was devoid of truth. For much of last year the Cape Times and the Cape Argus, fabricated a series of Fake News articles about Zille employing a ‘spook’ with a ‘grabber’ using, it would have us believe, the money of taxpayers to do so. It was all a pack of lies as the SA Press Council ruled but, hey folks, this is how the ANC rolls. The standard practice when an ethical newspaper disadvantages someone with a report which is not factual is to publish an apology of roughly the same size and on the same page that the original report appeared and the apology should outline what in the original article was wrong. 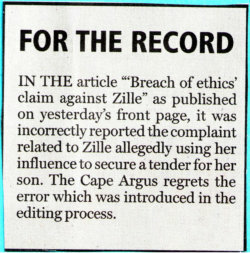 On 20 June the front page Fake News front page article published by Cape Argus editor Aziz Hartley was headlined Public Protector considers Zille probe and the online version was headlined Breach of ethics claim against Zille. It comprised 515 words. Hartley’s apology the next day totalled a massive 41 words in two sentences and it did not even extend to Zille the courtesy of using her Christian name. The standard exculpatory excuse from Newspaper House for such dishonest journalism is that an ‘error was introduced in the editing process’ or the falsehood is attributed to a ‘printer’s gremlin’. Which raises the question – why did the sub-editors not pick up the error? The answer, obviously, is that sub-editors with decades of experience and institutional knowledge have either left because they were not prepared to work in a news environment they came to regard as corrupt, or they were dismissed for refusing to obey orders in relation to such news practices or they were retrenched in a cost-cutting exercise that would not be necessary in a profitable company. All our stories must adhere to the highest standards required. This means they have to be balanced, fair and accurate. What they can’t be is one sided, inaccurate and prejudicial. There was only one set of instructions: be objective, fair, balanced and give everyone’s point of view. 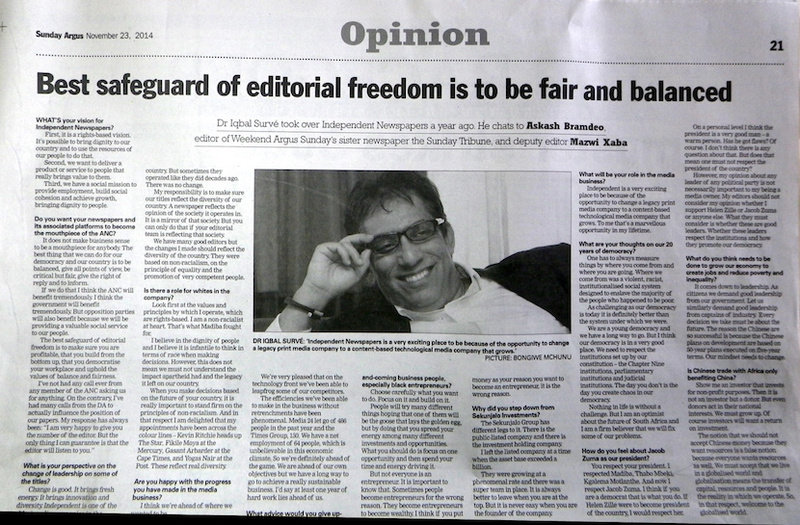 A year later, an interview with Survé was published in his newspapers which was headlined Best safeguard of editorial freedom is to be fair and balanced. Fake News? 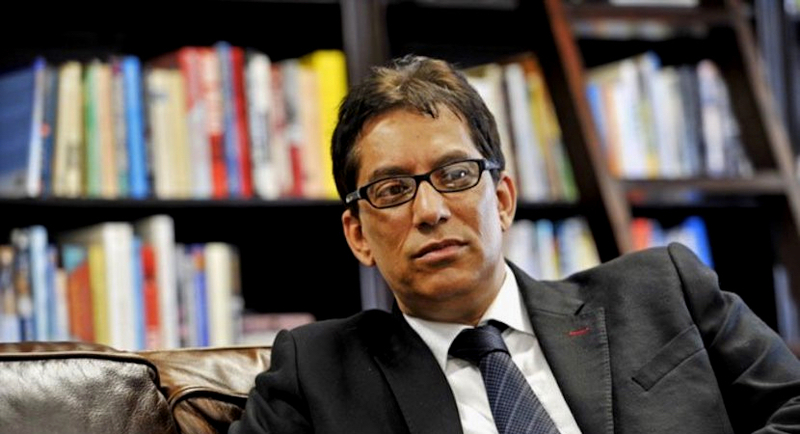 Iqbal Survé’s dictum that all articles carried in his newspapers must be ‘fair, balanced and accurate’.